I am the daughter of a farmer's daughter. My Mom, Mamie, was born in 1924 and grew up on a hard scrabble farm on the Alberta prairie. Her most formative years encompassed The Great Depression (1929-1939) and WWII (1939-1945). Her family was poor, and being frugal and self-sufficient weren't just admirable personal qualities, they were the difference between life and death. 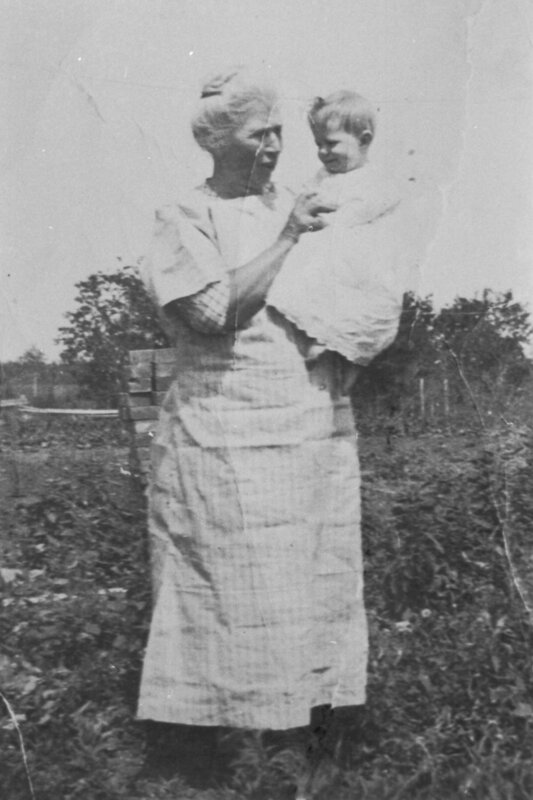 My Mom with her Aunt Mary, who lived with my Mom's family on their central Alberta farm (1925). Even as my Mom's material comforts increased in adult life, the abiding conviction that waste is an unforgivable sin remained, woven into the fabric of her being. Having had so little in her own childhood, she also cherished the inner life, the ability to make up in one's imagination what it may have been impossible to have in a family of scant financial means. My Mom with her sisters - home-made haircuts and hand-me-down clothes, during The Great Depression. When I summon my Mom's voice from my own childhood, the two things I recall her saying with the greatest frequency were "don't be wasteful," and "use your imagination." I'm my Mother's child and those lessons took root so deeply in me that they guide every aspect of my life, particularly my respect for all that the Earth gives us and my passion for ecological fibre arts. My Mother's hands were never still. In the evenings she mended, knitted, or embroidered. She taught me all three, and I particularly love knitting. We have become a throw away society, not because it brings us any pleasure (the research evidence shows that it has exactly the opposite effect on our psychological wellbeing), but because there is money to be made by some people in convincing the rest of us that we are never enough just as we are, and that we can not be truly happy unless we are perpetually pursuing ever greater material gain, regardless of the mortal peril in which this places the Earth and the survival of our own species. Thrift store cotton bed sheet dyed with plants from my garden. But you should know, gentle reader, that every element in your body came from stardust. The Earth is alive and keeps us alive too, though spinning madly through the cosmos. Compassion is the greatest treasure on Earth, and you are enough just as you are. I felt pretty rootless most of my life. I had lived in five different countries by the time I graduated from high school. As an adult, I lived, worked, studied, and travelled in several dozen more. Having the honour of ringing a temple bell, as part of a delegation collaborating with the Vietnam government to modernize public services. I spent decades working in public policy, some of it important work, some of it not, very little of it deeply aligned to my most cherished values. Throughout all the years, though, a passion for fibres and for ecology were comforting constants, and I pursued many different fibre arts - pattern and dressmaking, quilting, spinning, weaving and, of course, an ever-deepening fascination for learning the ways of plant dyes, as our forebears did for millenia. My own dress design from fabric dyed and printed with plants from my garden. Then a few years back, I found a little corner of planet Earth that made me want to rest my itchy feet. They repose there still, in an old farmhouse on a large acreage, encircled by Cape Breton Island's famous highlands. Here I tend the wild, re-planting as many native species as I can, listening to and learning from the plant and animal clans of the Acadian Forest and the wild shoreline. From the bounty of this place, I grow and make my own organic mordants and dyes, and continue to research the wondrous hues the Earth gifts us. The native Acadian Forest ecosystem of Cape Breton Island. Here I find the stillness necessary to hear my own inner voice, muted for so many years amidst the hubbub of big city living and a fast-paced career. Here, I shake the noise from my soul and turn my attention to work that nourishes. I know my Mom would have loved it here, but sadly she died a decade before I roamed quite long and far enough to finally find my home. I think of all the lessons she could have taught me about the soil, the wildlife, tending a wood fire, storing Winter vegetables, and so much more. Cape Breton Island is magical at every time of year. But I guess I learned enough from her to find this place and, finally, to put my heart first and to try to live a life that nurtures myself and the planet. Here, I finally feel tethered to the Earth, deep-rooted. I am not wasteful and I daily use my imagination. So, by way of introduction, that is something of the deepest roots from which I reach for the sun, and the genesis for my establishment of Mamie's Schoolhouse. I hope to use this blog to share some of the sustainable fibre arts knowledge I have developed over many years of research and experimentation, and that I teach through Mamie's Schoolhouse, and to shine a light on the guest teachers and Artists in Residence working with our studio. Thrift store cotton scoured, dyed and printed with garden plants and crafted into a bag. May we all find our way back to an affirming, Earth-centred way of life.